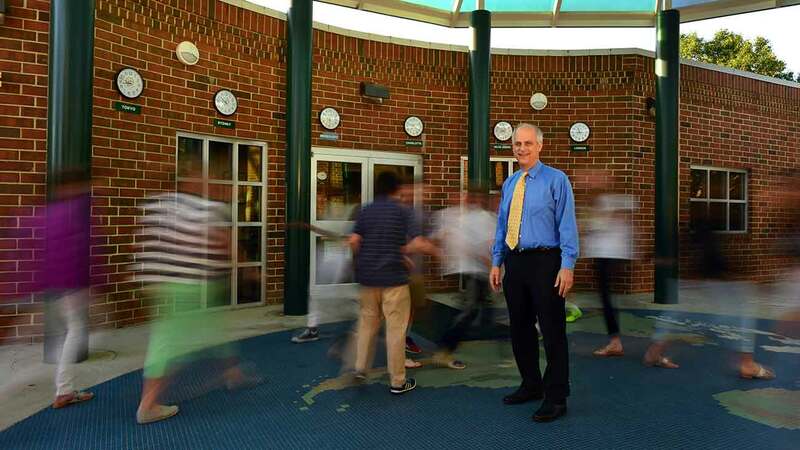 What do a head of school at Charlotte Country Day and the CEO of Southwest Airlines have in common? This story is part of our expert guest post program. Brian Formato is Principal at Groove Management, an organizational development consulting firm. On a wet rainy winter morning last year, I drove my daughter to middle school at Charlotte Country Day. Usually there are no greeters at the carpool line for middle school, but that particular morning was different. As we pulled up to the school a man in a rain slicker opened our car door, and with a smile, said good morning to my daughter and to me. Beneath the yellow jacket and hood I recognized that it was Warren Sepkowitz, head of the middle school. He wished my daughter a good day in class and wished me a great day as I pulled away. As I drove to work, I reflected on that experience. Warren Sepkowitz did not need to be standing out in the rain on a cold January morning greeting students and parents, but he did it. No one told him to go do it. He did it because he loves his job, cares for the students and he wants the parents to know that the school is teaching the students good values and life lessons. Warren’s small act is a lesson in leadership. I am proud to send my daughter to a school that cares and has a strong leader at the top. The experience had me thinking about the last time I recall a CEO or senior leader standing in the lobby of their offices greeting employees as they entered the building. I kept drawing blanks because I don’t recall that ever happening in my twenty plus years of corporate life. The closest I can recall is a unique and cool story. While working at Time Warner Cable as an organizational development director, I was tasked with helping our organization benchmark other companies that were known for providing excellent customer service. Through networking I had identified contacts at Southwest Airlines in Dallas. I was in Austin for other meetings and planned to meet my boss and our chief marketing officer in Dallas where we were scheduled to tour Southwest Airlines and to meet with members of their leadership team. I had a 7:30 a.m. flight on Southwest Airlines from Austin to Dallas. I got to the airport early, cruised through security and lined up in the “A” queue at the Southwest gate. As the queue began to grow I heard some commotion behind me. There was a tall man in a tan trench coat walking through the airport. As he was walking flight crew and gate crew kept going up to him to shake his hand or hug him as if he was some sort of celebrity. Who was this guy creating such excitement at 7 in the morning? As he got closer I recognized him. It was Herb Kelleher, the CEO and founder of Southwest Airlines. Not only did he get closer, he actually came to my gate. He went up to the gate attendant, gave her a hug and had a brief conversation before lining up in the “C” group queue along with all the other passengers. Apparently he, too, was taking this plane to Dallas. I was impressed that he lined up in the queue like all other passengers rather than cutting the line or looking for special treatment. When the gate opened, I was one of the first to board the plane. I took a seat in row one on the aisle. I was curious to watch the boarding process and to see what happened with Herb. Because he was in the “C” group he was one of the last to board the plane. Upon boarding he hugged the flight attendants, shook hands with the pilots and took a seat in the cockpit behind the two pilots. Once boarding was complete I went up to the cockpit introduced myself and told him that I was headed to his headquarters with our chief marketing officer and our vice president of people development. His comment was, “What would a big powerful company like Time Warner want to learn from his little airline?” Of course he said this somewhat jokingly. We chatted for a few minutes and he offered me a ride to the office. I thanked him but told him I would have to pass since I was meeting my colleagues at the airport. I did say I hoped to visit with him later in the day. The plane took off with him sitting in the jump seat in the cockpit. As we cleared 10,000 feet the captain came on the PA to welcome everyone to the short flight to Luv Field, Dallas. The captain then said “Sit back, relax, enjoy our 30 minutes flight and say hi to our friend passing through the aisle in the red Southwest Airlines shirt.” A few minutes later the heavily reinforced cockpit door flung open, and out popped Herb (who is a really tall guy). He was wearing a red Southwest Airlines golf shirt and carrying a large bag of Southwest Airlines peanuts. Herb handed me a small bag of peanuts as he proceeded down the aisle handing out peanuts to passengers, shaking some hands and thanking customers for flying Southwest Airlines. I never saw Herb again on the flight because he worked his way to the back of the plane where he must have sat down next to a passenger or crewmember for the remainder of the flight. I have had the good fortune to meet and work with many CEOs throughout my career. Each has their own style, but the great ones treat their employees with respect and they genuinely enjoy interfacing with their customers. While I never worked for Herb Kelleher, the stories are legendary. I felt fortunate on that early morning flight from Austin to Dallas to get exposure to Herb and his contagiously positive style. Warren and Herb are very different people, but they both are passionate about their jobs and believe in servant leadership. I have come to realize that a lot can be learned by watching leaders in action. Warren’s morning greeting of students and parents reminded me of the traits I admire in great leaders. The role of the leader is to support and inspire others. Leading an organization from the corner office is not a recipe for success. Being visible, and more importantly accessible to employees and customers differentiates the great leaders from the good ones. As leaders it is the small actions that can have large impacts. Think about the last time you greeted your employees or customers in the office lobby or at the front door to your retail outlet. If you have never tried it, go for it. That small gesture will have a lasting positive impact.